The tribulation is a seven year period of great hardship. Everyone on earth will experience disasters, famine, war, pain, hardship, pestilence, animal attacks, suffering and it will wipe out 75% of life on earth before the second coming of Jesus Christ takes place. Pretribulationists believe Jesus will rapture the Christian Church before the tribulation; causing the Christians to escape the tribulation. See more about the Rapture here. This seven-year period is considered to be the final week of Daniel's Prophecy of Seventy Weeks, found in (Daniel 9:1). (Each week represents 7 years). The first half of the tribulation is 3 1/2 years (1260 days) (Revelation 11:3). The second half of the tribulation is 3 1/2 years (plus a 30 day period) or 1290 days (Daniel 12:11). The rapture is described to occur at any time without warning. If the rapture occurred mid-trib or pre-wrath, people would have an idea when the rapture would occur. The Rapture and the removal of the “Restrainer” (The Church and Holy Spirit on Earth) occur at the same time. The Apostle Paul assured the church that the Antichrist would not be revealed until a restraining force would be taken away so that the Man of Lawlessness could be revealed. As the Holy Spirit also works in salvation (Jn. 16:8-11; 1 Jn. 5:7) during the Tribulation, then it is the Church that must be the Restrainer that is removed. Therefore, the Rapture and the removal of the Church must coincide, and at the beginning of the seven years. Definition of Black Outs: The Sun Will Be Turned to Darkness and the Moon to Blood (Joel 2: 30-31). Where are we on the Timeline? Referencing our Biblical Ages Page, it appears we are living in the latest phase of the Church Age. According to this conceptual 7000 year plan found on God's Clocks of Seven Page, we may be at the tail end of the Church age, making Jesus' return right around the corner. In summary, as of 2016, this information would put us at the very end of the Church Age, just one year before the rapture of the Christian church, the rebuilding of the Third temple, the 7 year peace agreement with Israel, and the Great Tribulation. The first half of the tribulation is much more mild than the second half, but nevertheless it is a time of great pain and suffering. The first half includes a transitioning to one-world government, the Ministry of Elijah, The Two Witnesses Ministry, The 144,000 sealed sons of Israel (Revelation 7:4), The 7 Seals, The 7 Trumpets, WW III, 1/4 of the earth being destroyed by war, famine, starvation and wild animals, the 7 year covenant, the persecution and martyrdom of the Post-Rapture saints, the Second Blackout, Animals turning on humans, Life without the holy spirit, the 10 Kings, 1/3 of humanity destroyed, humans tormented, 1/3 of fresh water destroyed, 1/3 of heavens destroyed, 1/3 of salt water destroyed, 1/3 of dry earth destroyed. 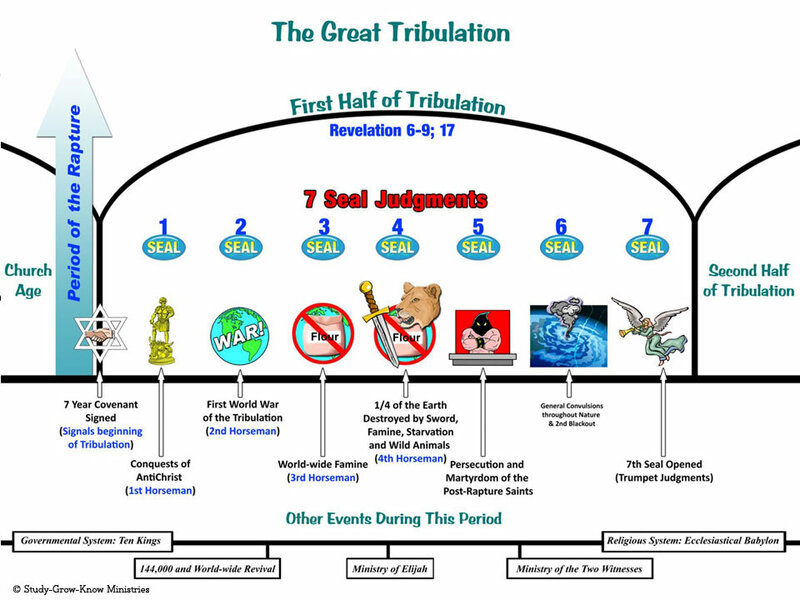 The Second Half of the Great Tribulation is 3 1/2 years long. It consists of a great period of pain and suffering to a degree that words cannot explain and humans will not want to endure. Some will want to kill themselves to escape God's wrath, but they will not die. Sores will grow on the bodies of those that took the mark of the beast. Salt water and fresh water will be turned to blood. The heat of the sun will be increased. The Euphrates river will be dried up. A great earthquake and massive hail will hit the Earth. Animals will turn on their masters. Large scorpions will sting and torment people with the mark. Jesus will battle the Antichrist near the Mt of Olives in Jerusalem and will slay the beast. He will ascend back to heaven from the Mount after burying the beast in Jerusalem. This will usher in the Messianic Kingdom. After Armageddon ends, and Jesus successfully defeats the Antichrist, there will be a 75 day period before the new Israel is lowered down from heaven to the Earth when the Messianic Age begins. During this period, the Antichrist and False prophet are cast alive into the Lake of Fire (after resurrecting them). Satan is thrown in The Abyss where he will dwell in his 5th abode. At this time we approach Judgement Day: The awesome and fearful day when every single soul is judged (even souls that died thousands of years ago). The Sheep and Goats are the 'lost herds' - these are the Gentiles who were never saved (for example, those who did not hear the word of Christ, or were not mentally capable of reading, or who died very young). Jesus will judge souls to be Sheeps or Goats: He will separate the wheat from the chaff: He will preach the gospel to the unsaved and determine from the heart, if this person is a sheep or goat. If they receive the message and love Jesus, and Want to do his will, they will be a sheep, but otherwise, if they do not receive the message Or they appear to be a person that is defiant (IE they want to go their own way), they will be judged as a goat. The Sheeps will be invited in to live in the Millenial Kingdom. The goats will go away into everlasting punishment. After the battle of Armageddon, a brand new temple is lowered from Heaven, and the Earth is forever changed to have new features (the sea has been removed), all things have been made new, corruption and sin have been removed, and the new Earth will be pleasing to God, as God will now dwell with men. This page was last modified on 15 February 2019, at 17:37.